Wilma was bad. Irma was worse in terms of debris. Miami Beach Director of Sanitation Al Zamora told City Commissioners this week Wilma left 135,000 cubic yards in the City and took 2½ months to clean up. “I’m estimating anywhere from 250,000 – 300,000 cubic yards out there [from Irma] so this is a long haul,” Zamora said. There is a risk to the City that it may not get reimbursed for the difference between the pre-negotiated rate and the final rate but Morales said FEMA recently issued a letter in Texas which was ravaged by Harvey allowing jurisdictions to pay higher than the pre-negotiated rate. “I believe that will be coming in Florida as well,” he said. “But I don’t want to wait for that … I know there are folks that are already getting impatient about debris” which is why he asked Zamora to put Irma’s debris into context with Wilma’s. 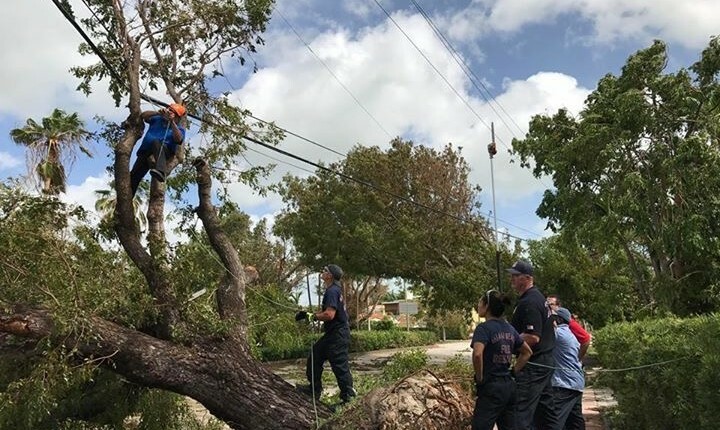 Morales said any costs not covered by FEMA would come out of the City’s emergency reserves and contingency fund though the City is utilizing special consultants for FEMA documentation to ensure reimbursement. “The expectation is that all the expenses that are related to the preparation and the recovery, hopefully, will be as much as 100% reimbursable by FEMA,” he told Commissioners. He added City departments are carefully tracking expenses to meet FEMA reimbursement guidelines. After voting in favor of giving Morales the authorization to increase rates for debris removal, Commissioner John Alemán asked for an explanation of debris cleanup priorities. Speaking to Zamora she said, “I think it’s really crucial what you told us – that Hurricane Irma brought down 2-3 times as much material as Wilma and that cleaning up from Wilma took you 2½ months so we – and certainly you as well – but we are going to get many, many emails from disgruntled residents about how long it’s taking.” She asked for a Letter to Commission “with a methodology of where we’re going next to pick up so we’ve got a rational explanation. What I don’t want is that whoever screams the loudest gets their debris picked up first. It needs to be transparent and methodical.” That explanation will be forthcoming according to Staff. Separate your debris into two piles on your curbside or the swale area: One pile for heavy vegetation and the second for all other debris. Debris should NOT block roadways, sidewalks, fire hydrants, utilities or storm drains. Plastic bags containing small tree/plant debris should not be mixed in with the loose piles of green waste. The City asks you to set those aside as they will be picked up by a different crew. If you have scheduled landscaping service, the City asks that your contractors take the debris with them to expedite the cleanup process. Residents are encouraged to help by taking vegetative debris to the Green Waste Facility located at 2800 Meridian Avenue, Monday through Saturday from 7 a.m. to 5 p.m. Businesses and commercial properties need to make arrangements for the removal and disposal of all debris. If you have additional questions regarding the process or have immediate concerns, call the Debris Hotline at 305-604-2444.